Out on Lake Titicaca a whole community has lived for countless generations with their homes gently floating on the waves. We joined one of numerous boats heading out through a passage cut through the a sea of green reeds. Turning a final corner you emerge into a wide bay surrounded on both sides with golden reed islands and huts. In the clear high-altitude air it’s like entering another dimension, completely separated from Puno. 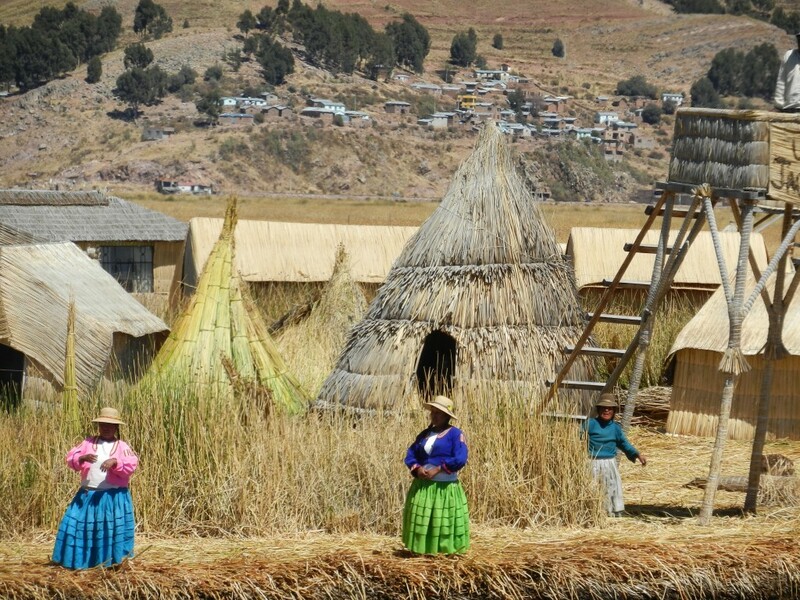 The Uros Islands are entirely built of reeds, forming large platforms. Each platform accommodates a few families in small reed houses and is surmounted by a tall lookout platform. Stepping on to a floating island is a little like walking on a trampoline – the whole thing is gently bouncy, not from the island moving but from the compression of countless layers of reeds. The Uros people use the totora reeds for absolutely everything from food, to medicine, to building. 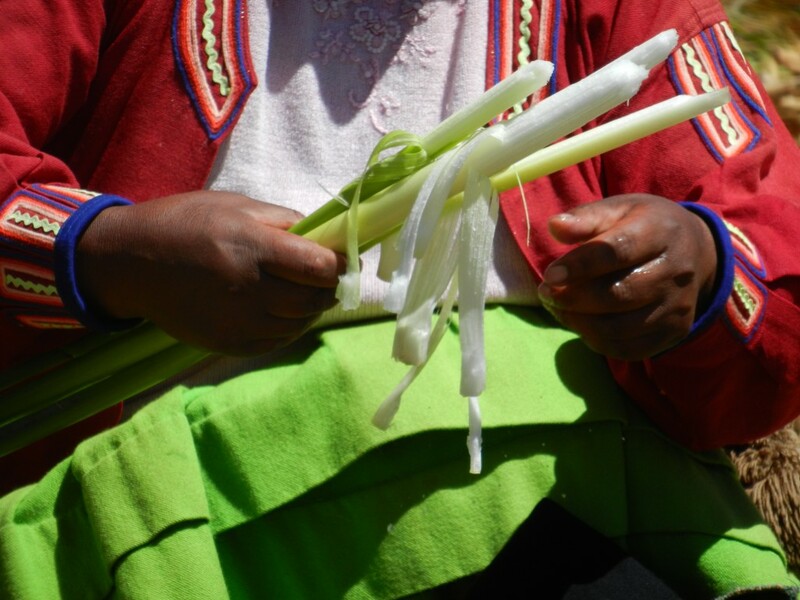 We tried eating some of the soft heart of the reed – a sort of combination of celery and bamboo-shoot tastes wrapped up into a mildly crunchy tube. Tasty heart of the reeds. Visiting the island is an unabashedly tourist experience. 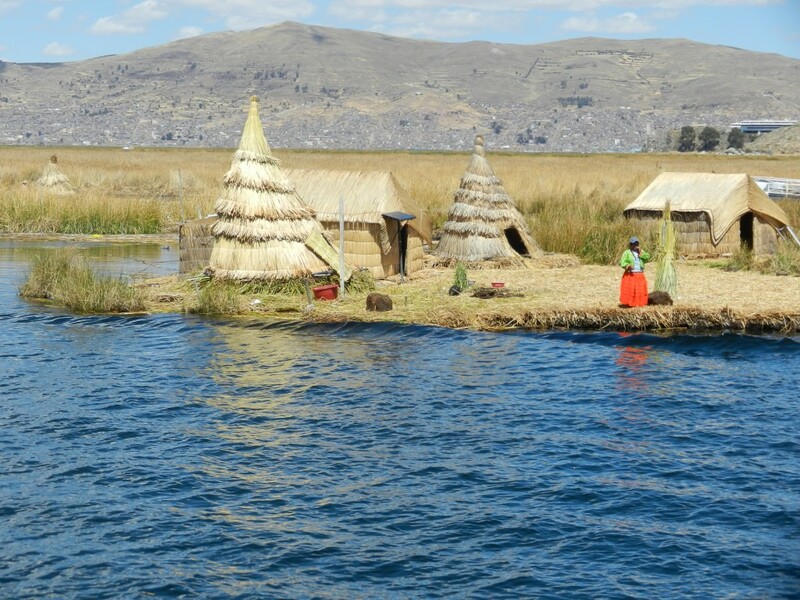 There are only a couple of hundred Uros still living on the islands and they have a well-worn but very endearing patter that vividly explains their traditional lifestyle. Apart from tourism they still live off their reeds, fishing and hunting. The huts have solar panels and small televisions but the fact they don’t try to hide those things makes the whole thing seem a more real experience. They do still have a largely subsistence lifestyle, but it is not without some modern frills. Us on a traditional ceremonial boat. Quite a few people I’ve read have hated the experience of visiting the Uros because it is a tourist thing. But the Uros people make no bones about what they are doing. 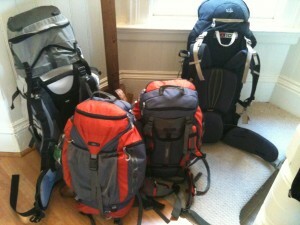 Welcoming tourists is just another facet of their life, dealt with in a happy and matter-of-fact way. This was a completely different thing to the fake cultural experiences you find in so many cities. What you see is what they live. They seriously live on reed mats in reed houses. They cook on small fires built on piles of stones. They have little adjacent outhouse islands where the reed roots absorb waste. There are no showers, running water, mains electricity, or anything like that. They row tourists about on ceremonial boats, but they don’t pretend that’s how they take their kids to school on the school island. 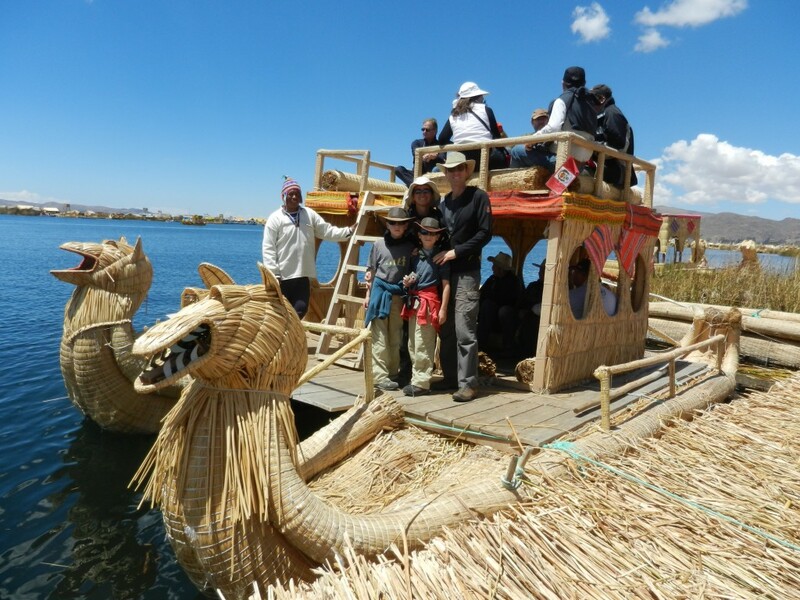 We thought their whole approach was great and the Uros floating islands were a beautiful and fascinating visit. Really how often do you get to see something as unusual as a people living on floating islands in the highest navigable lake in the world? Boys in a lookout tower. Spot the dark pom-pom – a sign she’s married.